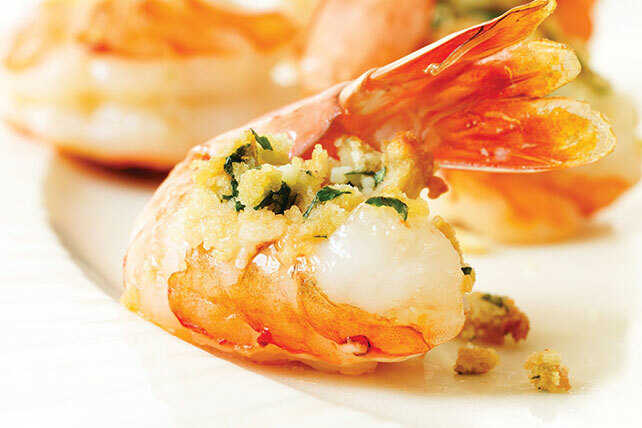 This easy-to-make shrimp dish is topped with a cheesy, garlicky crumb mixture and baked until delicious. Toss shrimp with 2 Tbsp. dressing in medium bowl. Refrigerate 10 min. Meanwhile, mix remaining dressing with remaining ingredients. Remove shrimp from dressing; discard dressing. Partially split each shrimp lengthwise by making long cut along underside of shrimp, being careful to not cut all the way through shrimp. Open shrimp slightly; place, cut sides up, in shallow baking dish. Top with crumb mixture. Assemble recipe as directed. Refrigerate up to 10 hours. When ready to serve, bake as directed.